Approximately one in every 700 babies in the United States is born with Down syndrome. According to the Centers for Disease Control and Prevention, an estimate of 6,000 babies are born with this genetic condition each year. Not all Down Syndrome are the same and each person can have a different type of Down Syndrome: Trisomy 21, Translocation Down Syndrome, or Mosaic Down Syndrome. Social skills may be impaired for some individuals with Down syndrome and some individuals living with this condition may have difficulty with communication, including limited speech and language. In an emergency, Down Syndrome patients are more susceptible to overstimulation, agitation, confusion or misunderstanding. Information about a person’s Down Syndrome can save a life. According to EMS World, it is important for EMS providers to recognize the basic elements of many disabilities. 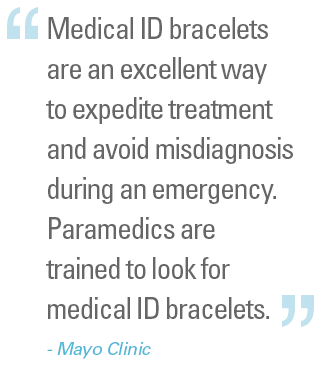 A medical ID bracelet or necklace can help EMS providers obtain as much additional medical information when patients are unable to speak for themselves. Medical IDs can be worn in the form of a bracelet or necklace. These options are important for wearers with Down Syndrome who are unable to tolerate a bracelet but like wearing a necklace and vice-versa. Custom engraved medical alert jewelry in different styles, colors, and fit offer comfort and enjoyment in wearing a medical ID at all times. Depending on the amount of information that need to be engraved, larger medical ID plates with back-to-back engraving can also be selected.